Online study makes for fascinating learning opportunities, and a blended learning experience that combines online with on campus is second to none. For each term of the EU Online MBA, students spend a week in one of EU’s European campus cities. Online MBA students visited both Barcelona and Munich earlier this year, where they enjoyed guest speaker sessions; industrial visits to BMW, the Franziskaner Weissbier Brewery, Freixenet and Hansgrohe; and in Barcelona, even a trip on a catamaran! During their time in Geneva earlier this month, students enjoyed the opportunity to meet one another, network and interact with their faculty members on campus. Exciting and unique educational and leisure activities kept them busy throughout the week, and the group relished the opportunity to explore the Swiss center of diplomacy alongside their classmates. 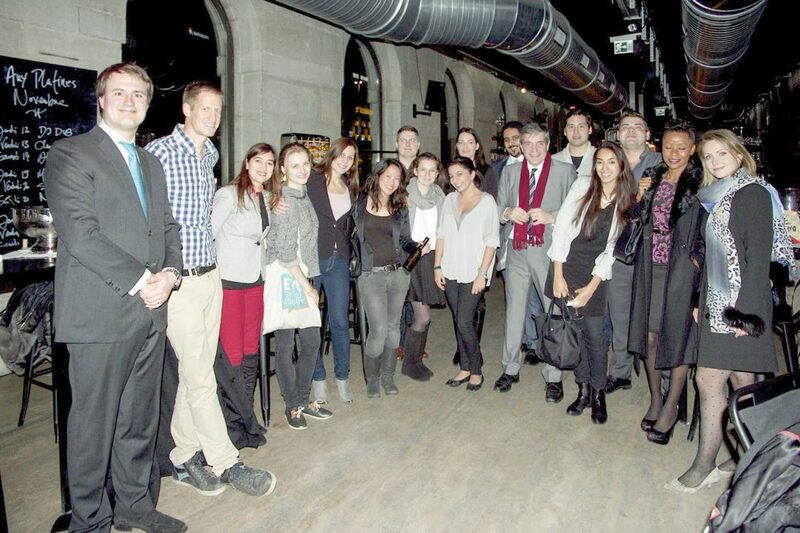 Students were given an insight into Geneva and spent the week exploring what makes the city special. To begin their week, students enjoyed welcome drinks at a wonderful bar near campus which is a regular host of EU events. The relaxed, casual atmosphere was the perfect environment for catching up and meeting new faces alike. Students had recently arrived from all over the globe – some traveling from as far as New Zealand and Canada – and jumped into their first opportunity to greet new people and put faces to names. The on-campus week comprised various activities that took place both in and out of the classroom. Members of the EU faculty and the excellent team behind the online campus took the opportunity to give more detail about how the Online MBA course works, explain what is expected of the students and give an insight into how the academic side is run behind the scenes. Students were given additional information and guidance on their upcoming dissertation in person, had the chance to ask various questions regarding the course during a Q&A session and also sat their exams. During the on-campus weeks, EU carefully chooses companies and organizations that reflect and embody the spirit of the chosen city. Geneva is renowned for luxury, and with this in mind, where better for the students to visit than renowned watchmakers Hublot and Blancpain and showcase manufacturer, Dietlin? 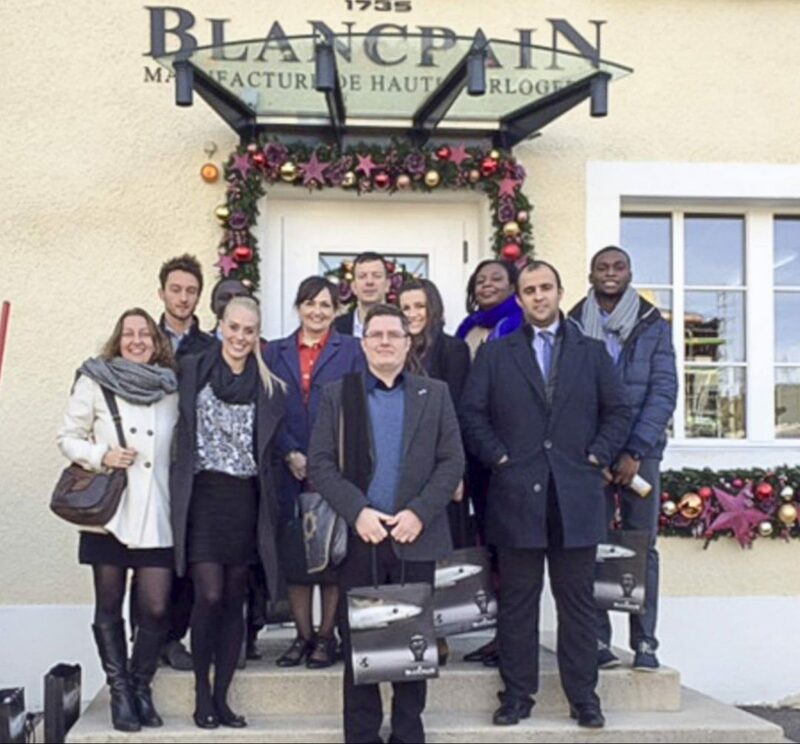 Early one morning, students excitedly boarded buses from the EU campus to travel to the Blancpain and Hublot workshops, where they saw behind the scenes, heard from experts and were dazzled by exceptional pieces of luxury jewelry. The visiting students and staff members alike were captivated by the dedication, attention to detail and precision demonstrated as watches were intricately and lovingly crafted by hand. Bernard Fierens took time out of his exceptionally busy schedule at Edmond de Rothschild, one of Switzerland’s foremost private banks, to spend time sharing his experience with our Online MBA students. Fierens is an expert in the industry who has dedicated his international career to doing what he enjoys. He has worked in the banking field for over 30 years, speaks six languages and has lived and worked in various European countries. 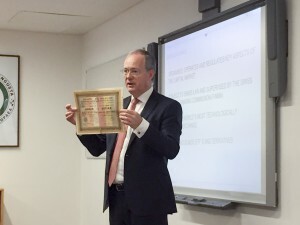 He gave a dynamic, engaging talk on the subject of banking, covering topics such as bonds, risks, recessions and investments; before inviting and encouraging questions from the captivated students. Claudio Di Salvo graduated from EU with an MBA, and has since gone on to enjoy success in the field of aviation. He is currently the SAP Release Manager at the International Air Transport Association. 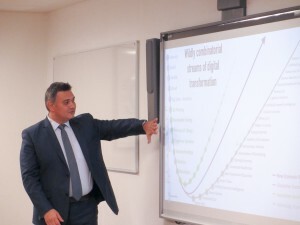 His presentation to the Online MBA students was entitled “The Digital Transformation in Aviation”, and gave students an insight into his working life within the technology and aviation industry. Switzerland is famed for its cuisine, and a chilly first week of December marked the perfect chance to get to grips with the food! Students enjoyed a lovely meal at the Edelweiss Hotel in Geneva with both faculty members and management, amid a warm, welcoming typically Swiss ambience. Meat and cheese delicacies were accompanied by fine Swiss wine and followed by a delicious chocolate fondue served with a selection of fresh fruit. The event was a huge success thanks to the students taking time from their busy schedules to attend, the hard work of the EU staff and faculty and the good planning and organization skills of everyone involved! Next up, the students will head to Munich in the new year to explore the Bavarian capital.